Data by Zillow tells us a story about why people are moving or staying and it has a lot to do with family roots. Living closer to extended family is a higher priority for lower-income Americans. 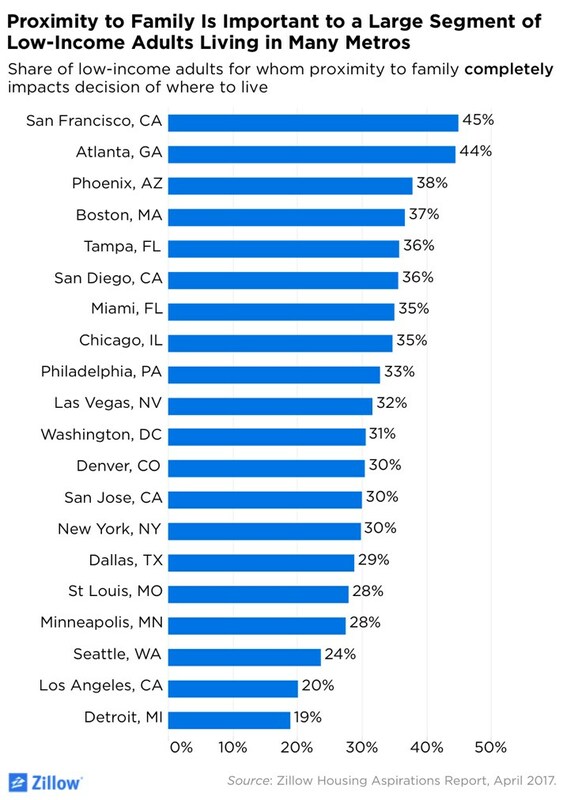 According to Zillow’s Housing Aspiration Report, when respondents were asked about the extent to which proximity to family drives their decision to move. The survey reported that 32 percent in the lowest income quintile said proximity to family completely affects where they live, compared to 22 percent of the respondents in the highest income quintile. Age also seems to play into your importance on family proximity, but despite age the same income patterns are true. Respondents who were 65 or older, 38 percent in the lower quintile said proximity to family drives their decision of where to live. While only 28 percent of the same age group in the highest income quintile listed proximity to family as a decision factor. 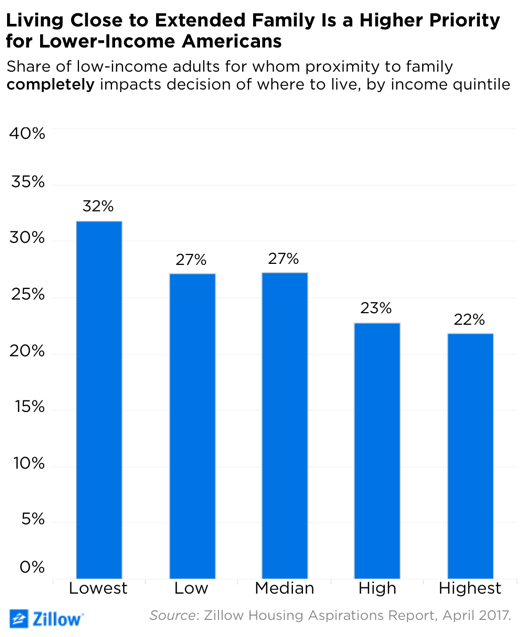 The younger respondents (ages: 18-34) were less likely to care about proximity to family – but the income level still held true as 26 percent of this age group in the lower income quintile versus only 11 percent in the higher income quintile listed family as a moving decision-making factor. Across the 20 markets that were surveyed, lower income respondents in San Francisco, Atlanta, Phoenix and Boston were more likely (than the other metros) to state family has a key decision-making factor that drives living location. Lower income adults in Detroit, Los Angeles, Seattle and Minneapolis were the groups less likely to base their move on the proximity to family. Reasons for this probably have to do with lower income Americans needing family help with childcare and elder care. But, as movers – we are always sensitive to all kind of reasons why you need to move. Whether you’re moving back home to be closer to family or away from your next dream job, George is always here to help you make your next dream a reality. Give us a call for a free, no-obligation moving quote today and we can get you closer to that next chapter of your life.